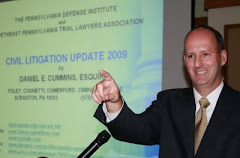 I was recently invited by The Legal Intelligencer/Pennsylvania Law Weekly, for whom I write a regular civil litigation column, to participate in a series of video presentations for their website. In the first video clip generated, Pennsylvania Law Weekly staff reporter Ben Present and I discuss the emerging issue of social media law. In this installment, we discuss whether Facebook pages are discoverable. This video is part of the paper's Social Media Law collection, which features news, analysis, videos and an interactive timeline on this growing area of law. Other clips are expected to follow. To view the first installment video clip on the discoverability of Facebook pages, click HERE. I thank reporter Ben Present for inviting me to participate in this discussion.